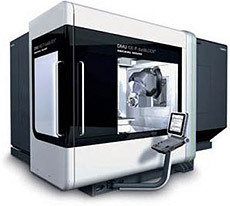 The DMU 125 P duoBLOCK® five-axis machine offers a traverse path of 49.2 inches × 49.2 inches × 39.4 inches and standard spindle speeds of 12,000 rpm. (with the option of a spindle with speeds of up to 24,000). The sturdy machine bed fe	atures a proven three-point support design and linear guides offer maximum rigidity.